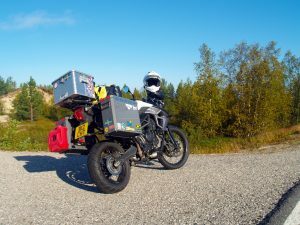 When I bought my first Tiger back in March 2011, my plan was to ride it overland to Hong Kong. 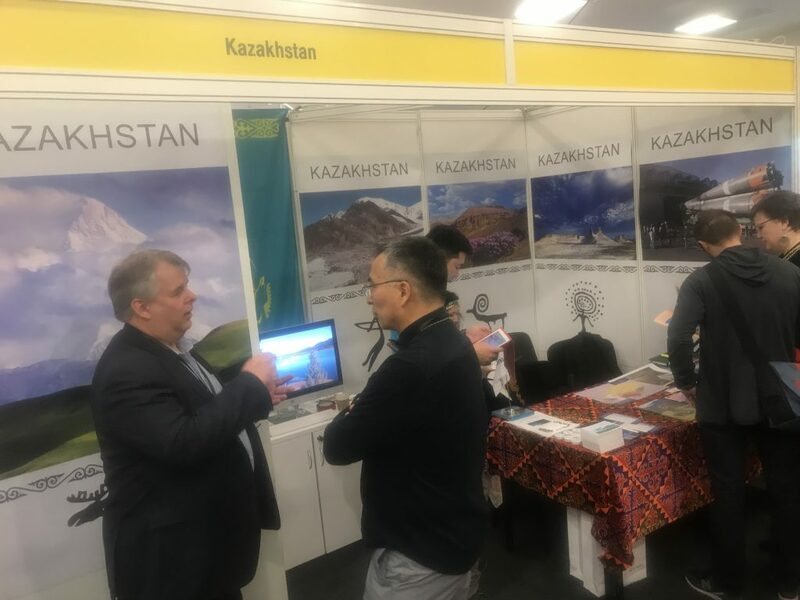 Quite early on, I signed up to several forums so that I could get information in order to prepare for that trip, but soon discovered that my dream adventure would not be so easy… then life got in the way and the whole dream was shelved. During that time, the orange Tiger and I did venture out on the trails and byways around Suffolk, Norfolk and Cambridgeshire but I soon realised that the bike was way too heavy and my talent was way below what it needed to be to manage such a powerful bike on anything but tarmac. So, it’s been 5 years since I’ve ventured off the black stuff and life has moved on again. 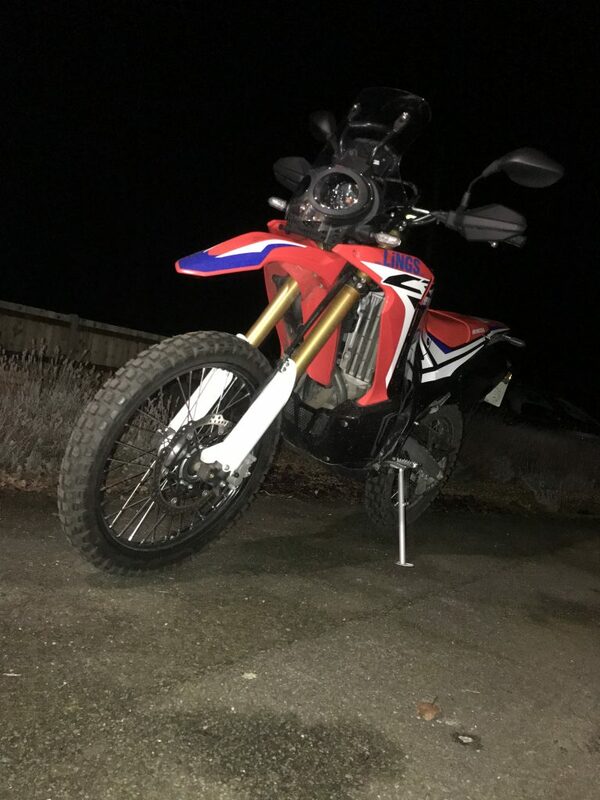 My second Tiger, that has only seen tarmac, is going up for sale and a brand new CRF250 Rally sits in the shed with a plan for a friend and me to ride to Mongolia and beyond in 2020. This weekend, it was time to get the bikes baptised with mud! 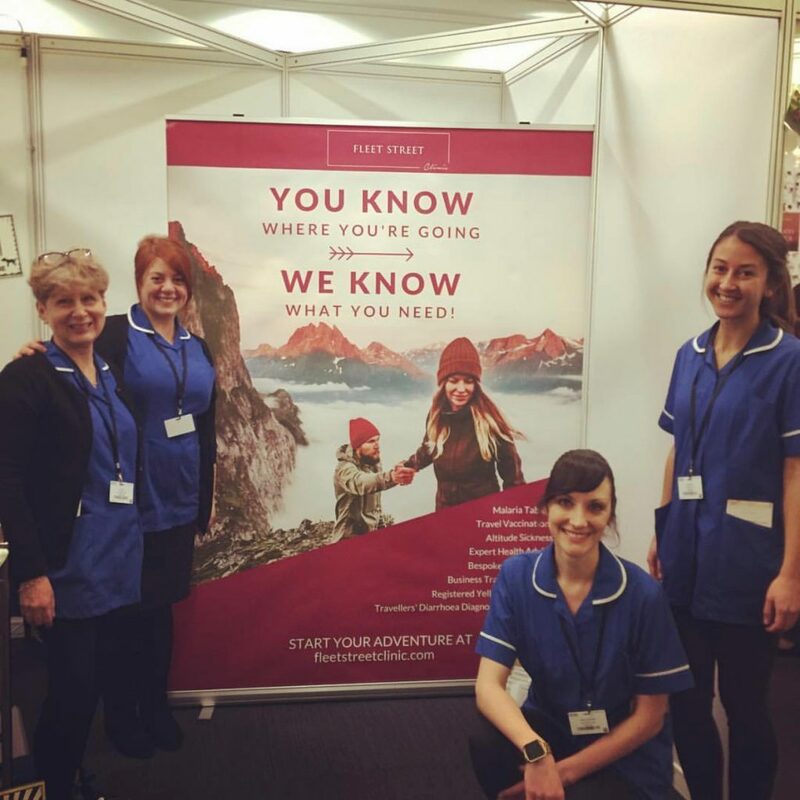 Over here in East Anglia, we don’t have too much in the way of mountains or even hills for that matter: what we do have is Thetford forest and a couple of hundred miles of trails. 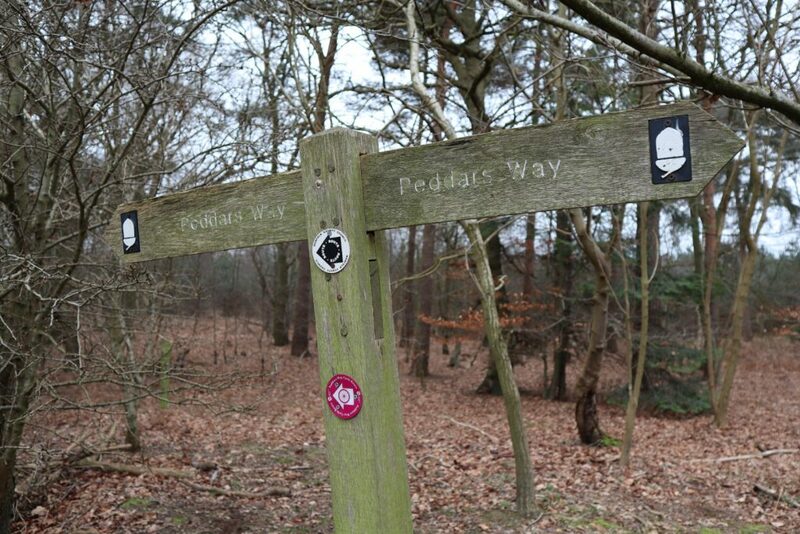 We didn’t want to do anything too stressful so I suggested doing a bit of the PeddarsWay, a 46-mile trail that starts just east of Thetford and goes in a north-northwest direction, ending on the north Norfolk coast by Hunstanton. Anyway… we ended up doing virtually all of the trail apart from a few miles at either end which are not accessible to vehicles. Considering that neither Mike or I had been off-road for 5 years or more, we were both amazed that neither of us fell off. 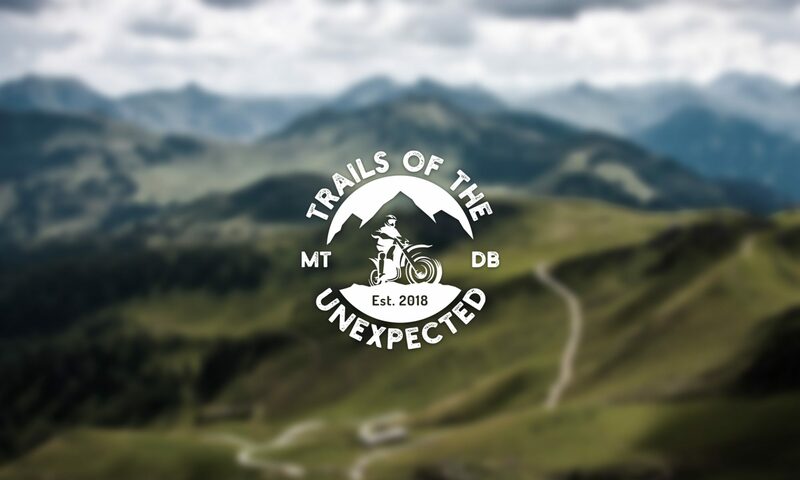 That could be down to the fact that the trail wasn’t that technical or it could be down to the fact that the bikes are more suited to this kind of riding than some 230 kg touring bikes! We both agreed that we had a great time with laughs aplenty. We were also amazed that we didn’t see anyone else out on bikes as the day was perfect. It was a little drizzly in the morning but once we had a few miles under our belts, the sun came out and it was the perfect day: not too hot and not wet. We arrived at the end of the accessible trail and rode to the nearest village to find a chip shop where we had a much-needed tray of chips and curry sauce. Then it was back on the bikes for the long ride back home. In total, we covered around 195 miles, setting off from home at 9:30 am and returning at 7:30 pm; exhausted but happy with our day. The fitting of the Tusk pannier frame got off to a bit of a bad start. 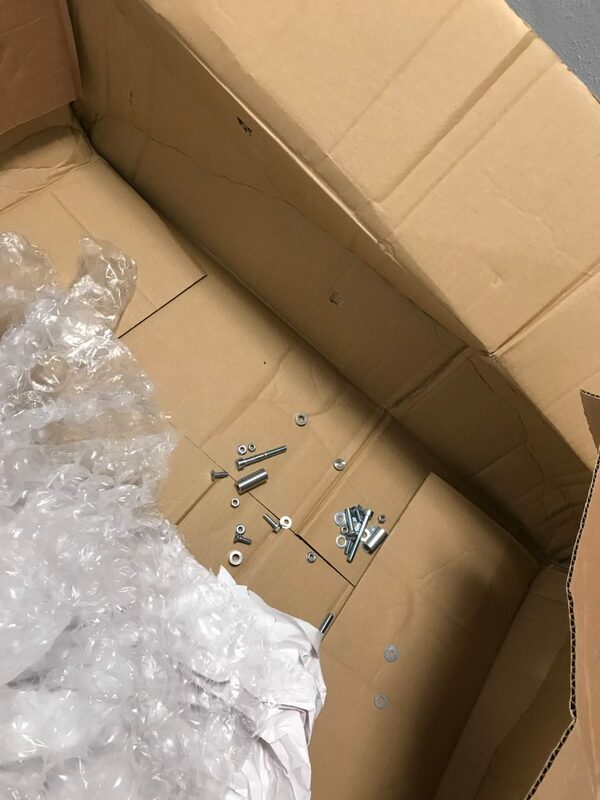 When it arrived from the USA the box was a dreadful mess and it was obvious that bits were going to be missing! So after carefully unpacking it I found that the frame itself was actually all still there, a huge plus! The same couldn’t be said for the fixings though. I knew straight away that I was going to have to contact the seller in the USA and get some replacement fixings sent. Not wanting to be perturbed I got on with the mounting of the frame to the bike to see how it matched up. Initial lineup looked good and with the use of some spare bolts and fixings I had in the workshop I started to get the frame onto the bike. Generally the frame itself is very well put together and pretty solid however, some of the holes for fixing it to the bike and for attaching the rear rack weren’t in the right places and so some extra drilling and fiddling was required to get the frame to fit the bike with ease and without stressing all the components to make it line up. 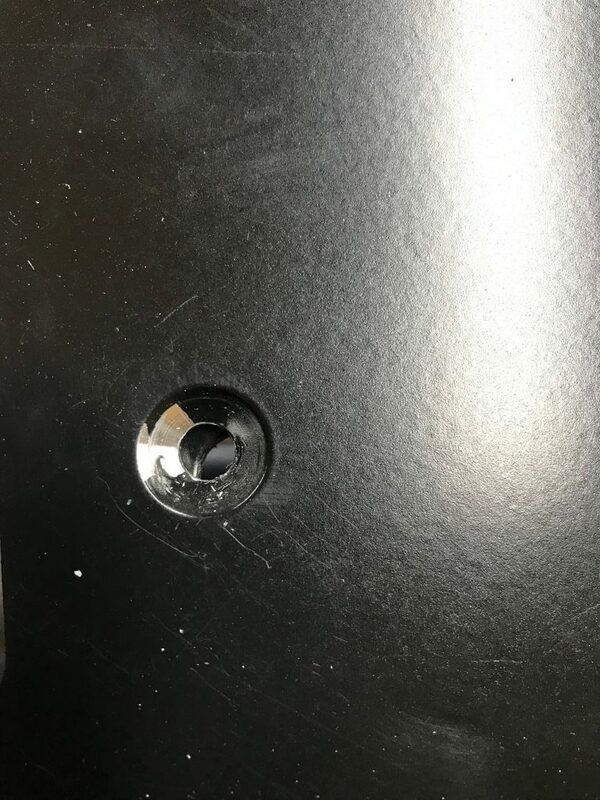 Hole alignment was not the best! 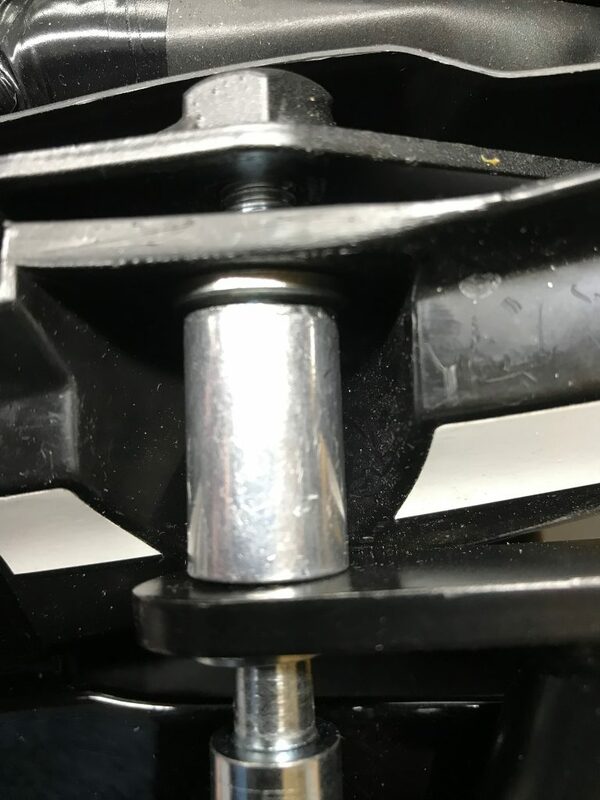 Another issue was with the spacers that fit either side of the seat, as supplied they were some 4mm to 6mm too long which meant if they were persuaded to fit the seat would no longer fit. 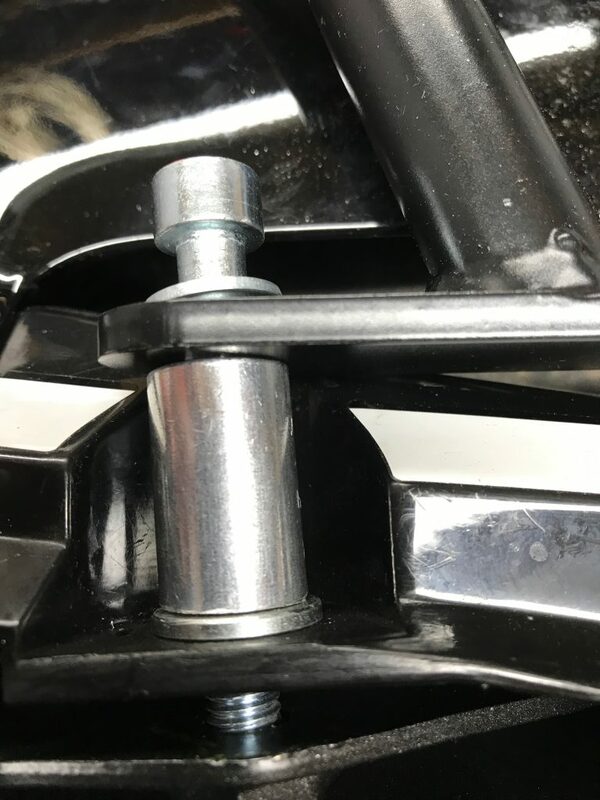 This resulted in taking it apart again and cutting and refinishing the spacers to get the frame to fit such that the seat would also fit at the same time. This alone took most of one evening to achieve to ensure I didn’t cut too much off the spacers. It’s clear that some of the fixings are off the shelf items and not specifically manufactured for the frame. Fortunately I’ve got a fairly well equipped workshop and this kind of thing is fairly easy to do but for someone who doesn’t have the same facilities this is going to be an issue. It’s also interesting to note that the two spacers end up being different lengths to fit, something I need to remember the next time I want to take the seat off. After much time was spent re-drilling holes and cutting down spacers I finally got the frame to mount with ease and without everything being stressed to line up. This means that should I have the need to remove the frame in the future it should come off easily and more importantly, go back on easily. It’s a nice looking bit of kit and I hope it proves to be as good as it looks as it wasn’t cheap. Total cost including shipping and import taxes took the price to a whopping £291.25 UK Pounds. 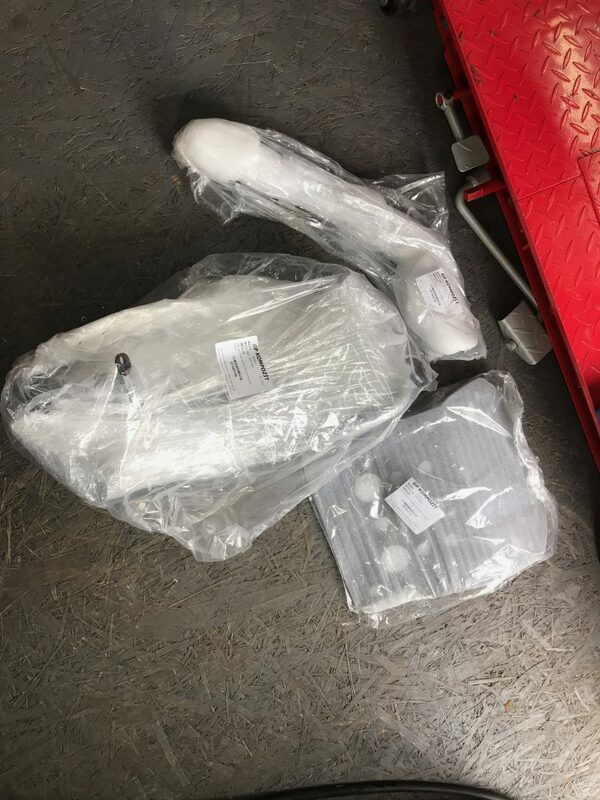 I’ve now ordered the Lomo soft panniers to go onto the frame and so will put together some information about how they look, fit and feel once they arrive. Time to get ready for adventure! The bikes have now had their first service, yes 600 miles have already gone, it’s not been much fun as February in Suffolk is cold and icy but hey, we’re there! So this afternoon I rolled my CRF250 Rally into my workshop and set to. 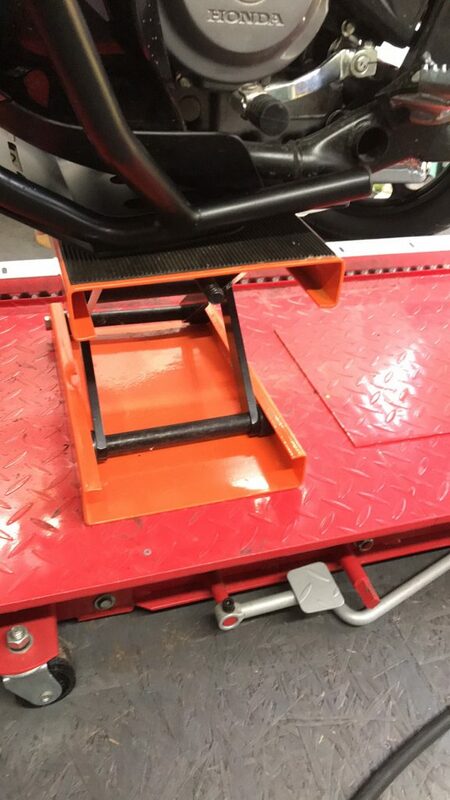 First thing to fit a crash bar and skid plate combo from GP Kompozit in Istanbul, Turkey. Really well priced and the only bars and skid plate combo available in Europe. 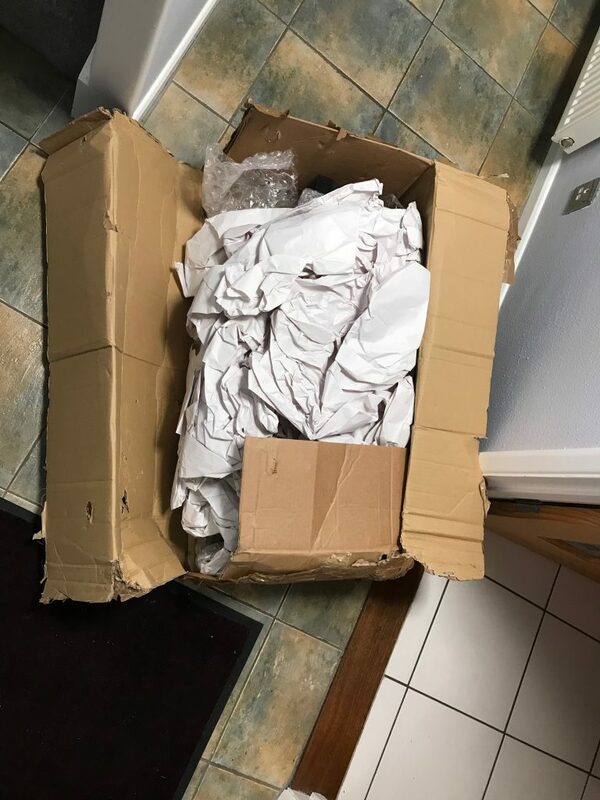 They arrived extremely well packed in a larger box than I was expecting but I was really pleased to see they’d been packed to survive anything the couriers could throw at them. The bars are really well put together and are much more substantial than I imagined. Welds are nicely tidied and the paint is good but chips if not careful. 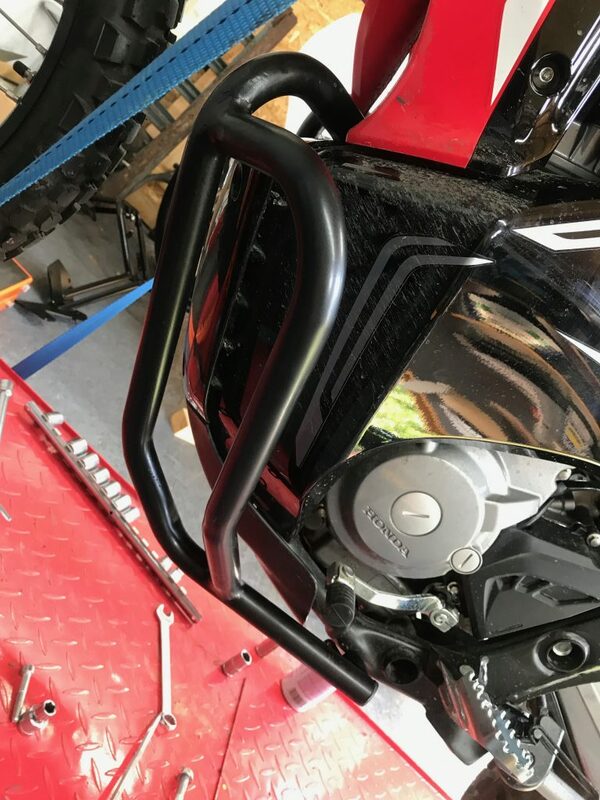 Fitting the bars was fun, I had to remove the front plastics to be able to get in to tighten the clamps at the front and also remove the rear bottom engine mount bolt as a longer one is supplied so that the rear of the bars mount at the same point. 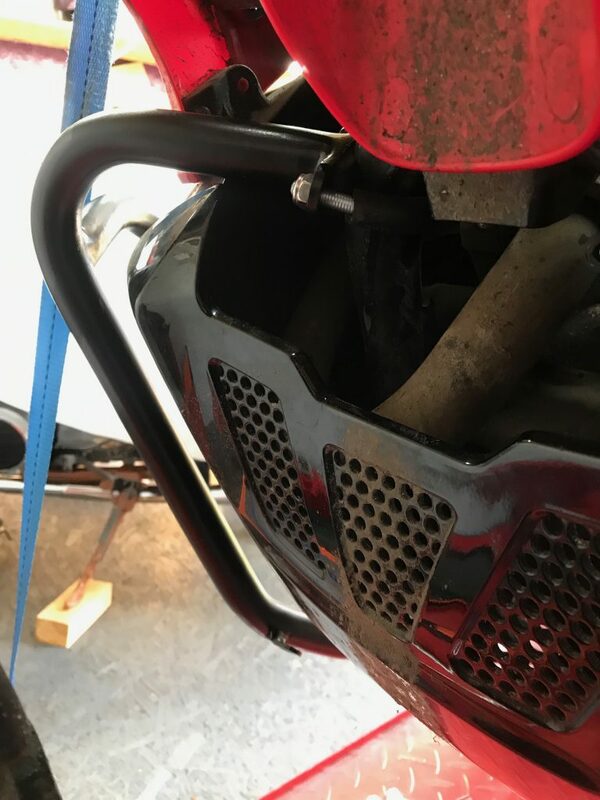 Getting the front plastics back on actually took longer than the fitting the crash bars, getting it all lined up, plastic pegs in their slots and the screws back into their threads needed 3 arms and four hands! 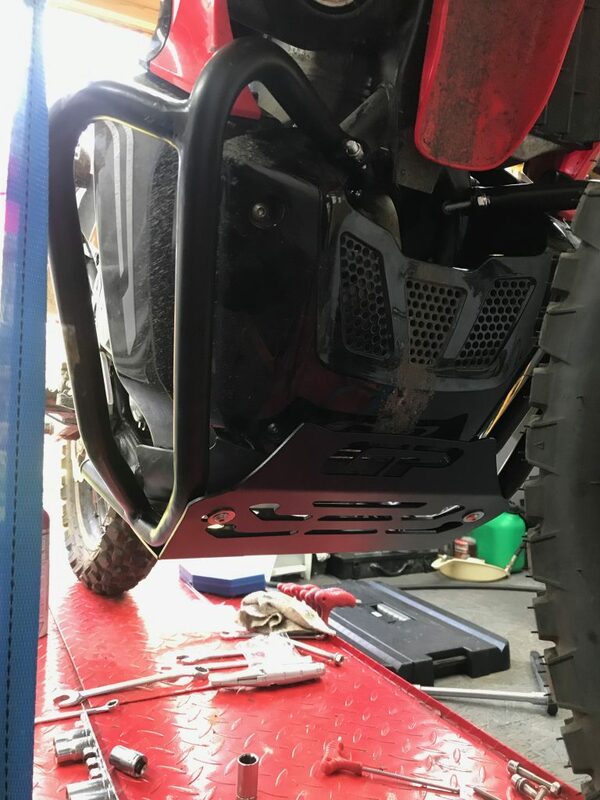 Now that I’ve got a solid aluminium plate under the engine sump I can finally use my bike lift to support the bike without breaking the plastic underbelly. 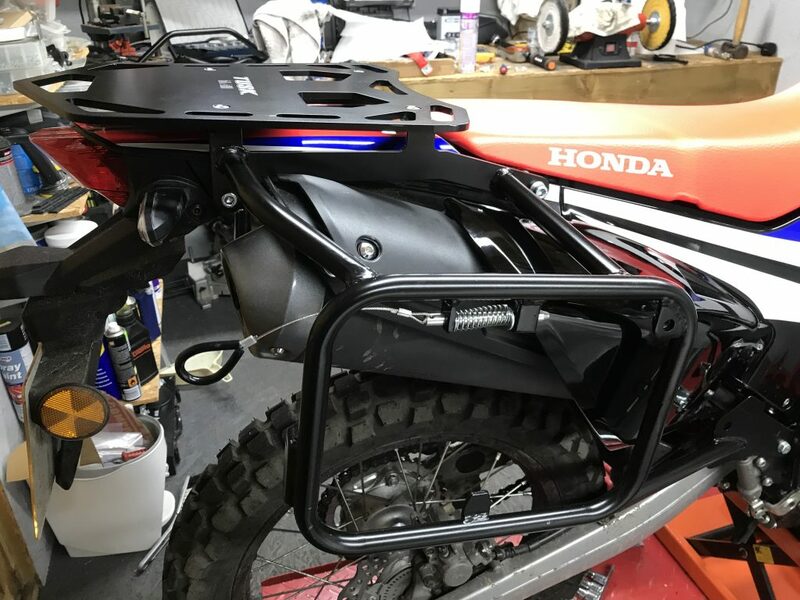 The bars are really well secured to the bike and very solid. It’s also given us some great grab handles for dragging the bike out of the mud and sand and a place for me to fit my crash bar bags. Of course, primary function is to protect the engine which they do nicely! 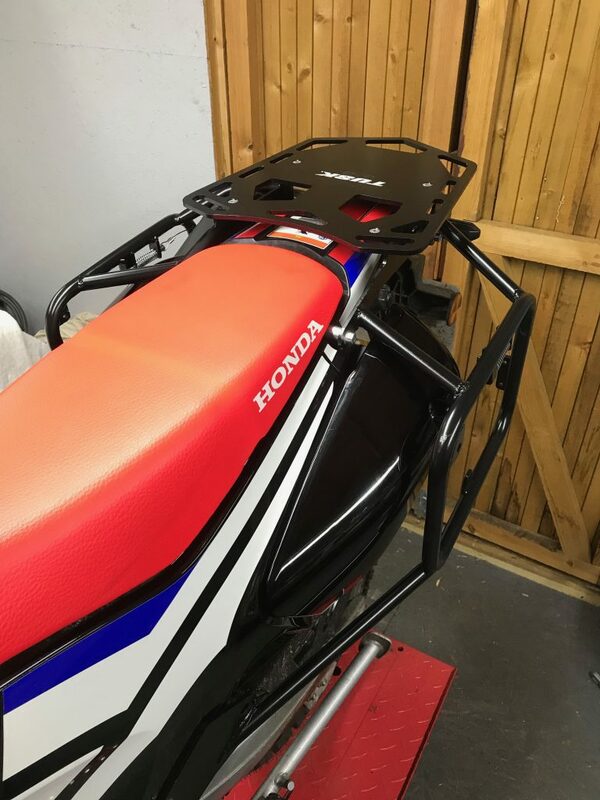 What’s also nice is that you don’t have to remove any of the original plastics, the crash bars and skid plate fit around everything, overall a nice design. 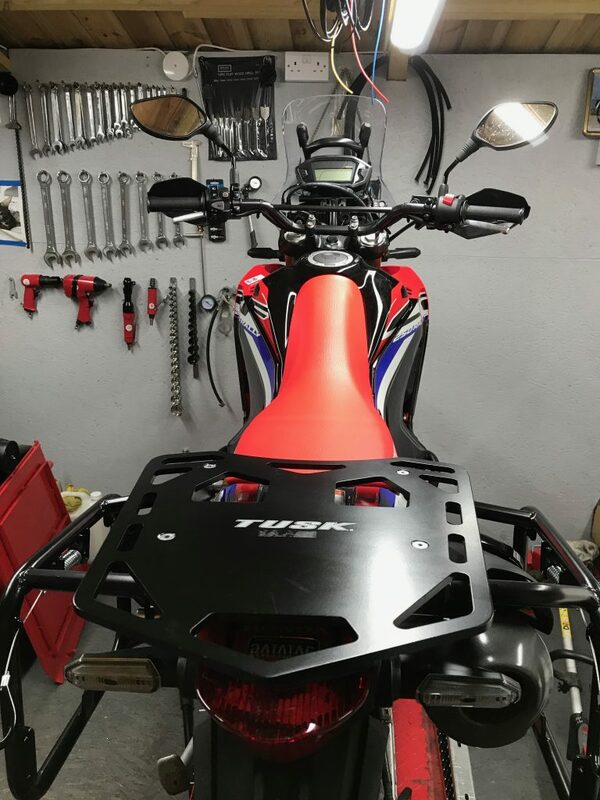 I’m now just waiting for the upper crash bar kit to arrive and the bars will be complete. Just in from another winter evening ride, now got 575 miles on the clock, another 25 miles needed before Saturday for the first service. This little bike goes incredibly well, you’d never think it’s only 250cc. Cruising at 70MPH is easy and it still returns 89MPG. Can’t wait until I can open it up a bit as it really starts to get exciting over 6000RPM. How fast does it go, Mister? One of the first considerations when planning an adventure like ours is to decide what bikes you plan to use for the journey. We’ve all seen Ewan and Charlie manhandling their huge BMWs through Eastern Russia and some of us have seen Austin Vince and his Mondo Enduro group taking the very long way round on old, modified Suzuki enduro bikes. 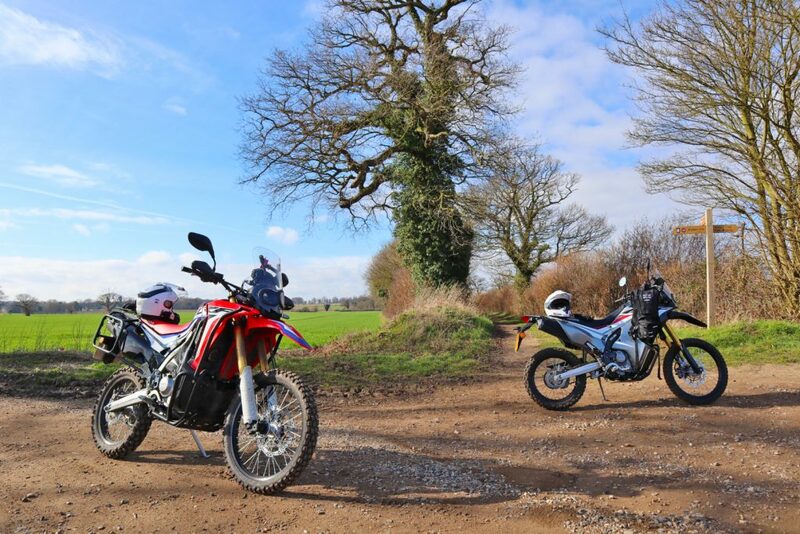 The popularity of The Long Way Round/Down combined with the ageing motorcycle riding population has led to the rise of the “adventure motorcycle” sector which has given us a huge choice of potential mounts. Virtually every manufacturer now offers their interpretation of what an adventure bike should be, from the narrowly focussed CCM GP450 Adventure through to recently announced Harley-Davidson 1250cc Pan America. 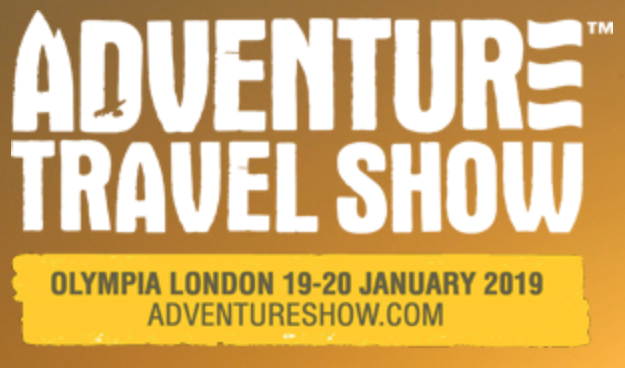 Many of the manufacturers follow a similar path of producing a “big trailie” bike similar to the way that car manufacturers are building 4×4 vehicles that will never go off-road in their life: most of them know that the majority of adventure bikes will be used for two-up with luggage touring on tarmac. So the task began to search for our perfect bikes for this trip. 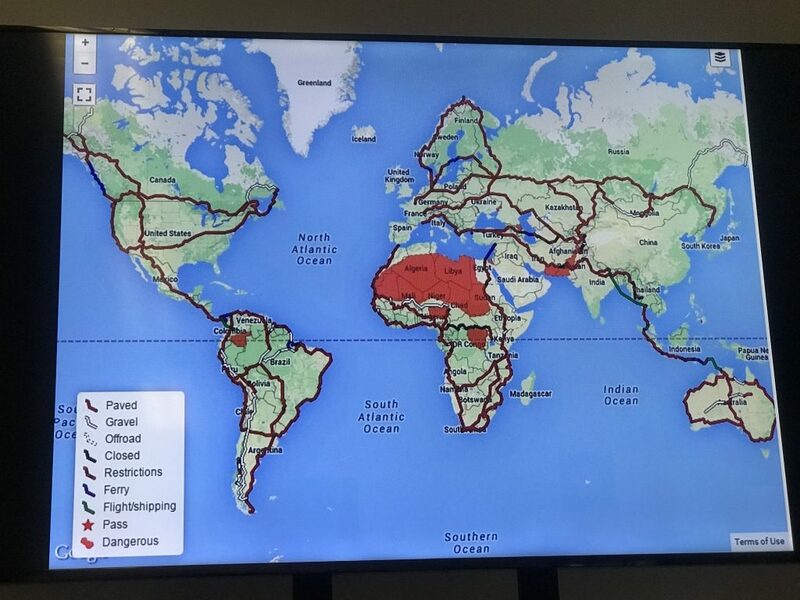 Both of us have already bought into the adventure bike scene with me owning a Triumph Tiger 800 XCx and Mike riding a Kawasaki KLE 1000 Versys, both of which are excellent touring bikes but neither are really suited to the kind of riding that we envisage during this journey. I immediately narrowed the search by imposing a £5,000 cap on the price of the bike and both of us decided that the lighter the bike is, the better it would be: Triumph claim that the dry weight of the XCx is 205 kg and Kawasaki have the wet weight at 239 kg for the Versys 1000. These weights are without all of the add-ons such as panniers and crash bars that’ll soon get you struggling to lift the bike off its stand one last time at the end of a long day of riding, so the idea is to get something that’s light to start with and keep the weight as far below 200 kg as possible without too much compromise. These self-imposed limitations immediately ruled out all of the flagship adventure bikes above 1,000 cc and the majority of mid-sized (650 – 800 cc) bikes. Even the Suzuki DL650 V-Strom, which we both like, weighs in at a staggering 220 kg wet and, upon closer examination, we found that the ground clearance is that of a street bike, not something that can climb mountains, forge rivers and cross deserts. 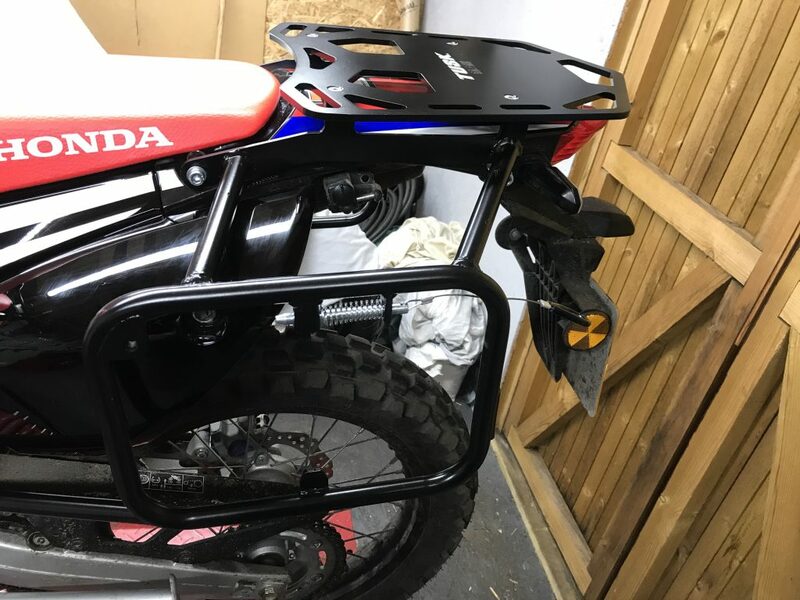 So this gave us a short list of four bikes… that doesn’t sound very many but I also didn’t want to go too old (DR350) or have to make too many modifications to the existing platform; I just wanted to add bags and go! The four bikes were the Yamaha XT660Z Ténéré, Kawasaki’s Versys-X 300, the Royal Enfield Himalayan and the totally left-field SWM 650 Superdual Adventure. 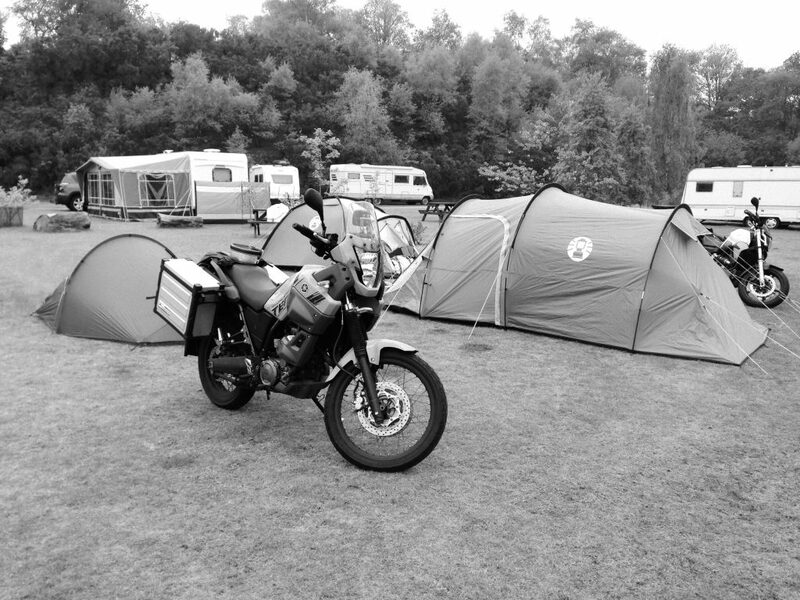 Mike really likes the 660 Ténéré as he previously owned one that he did many miles on whilst touring around Europe. I agree that it is a very capable bike that I really like the look of. Some other friends have owned them and none have had anything bad to say about them. They are powered by an engine that has been around for decades: Yamaha’s 660 single can be traced all the way back to the 1976 XT500 and has been refined and kept up-to-date in many guises since. I had never ridden one (although I have had different versions of the engine in other bikes and I do like a good old thumper) so I decided to find one to test ride. This was a bit difficult as Yamaha stopped bringing the 660 Ténéré into the UK about 10 years ago and people who have them seem to like and keep them. We eventually found one at a dealership in Essex who was willing to let me have a test ride: he was asking for the top book price but when we looked at the bike, it didn’t seem in that good condition with damaged side panels and a jacked-up rear end. The test ride didn’t help as something just didn’t feel right: as though the bike hadn’t been looked after. This experience put me off a little, however, I did keep an eye out for another but none turned up. Just before Christmas 2018, we were able to try out the 300 Versys-X which, looking at the spec sheet and sitting on it in the showroom, seemed like the ideal bike. 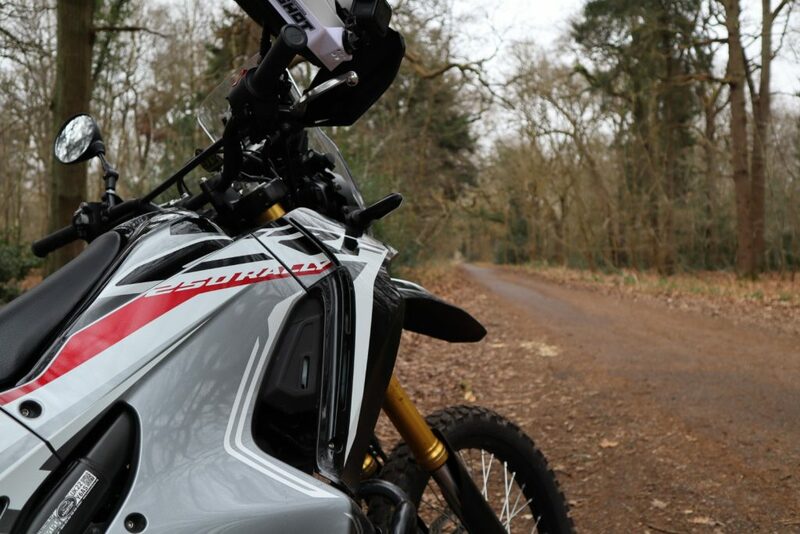 At just 175 kg wet and nearly 40 horse power, it looked like a winner: light(ish) and quite powerful for a 300 cc twin, it should be able to cope with any terrain as well as the odd dual carriageway that we should happen upon. In reality, however, the engine seemed very buzzy – ideal for a street bike but not so good when negotiating a gnarly, boulder-strewn trail. This was a real shame as Mike really liked the bike on our 20 mile jaunt over to Sudbury, likening it to an old 2-stroke from his youth. I, on the other hand, wasn’t as enamoured as I didn’t like having to rev the little engine to get anything out of it: by the time you’re doing 30 mph, you’re already in 6th gear! I did have a little fun on the way back to Ipswich: on this rare occasion, the A1071 was empty and I was able to have some enjoy twisties on this little bike, winding it up into the “power band” and letting it flow from one corner to the next, I really did have some fun, however, this is not how I would like to spend 6 months travelling through distant lands. 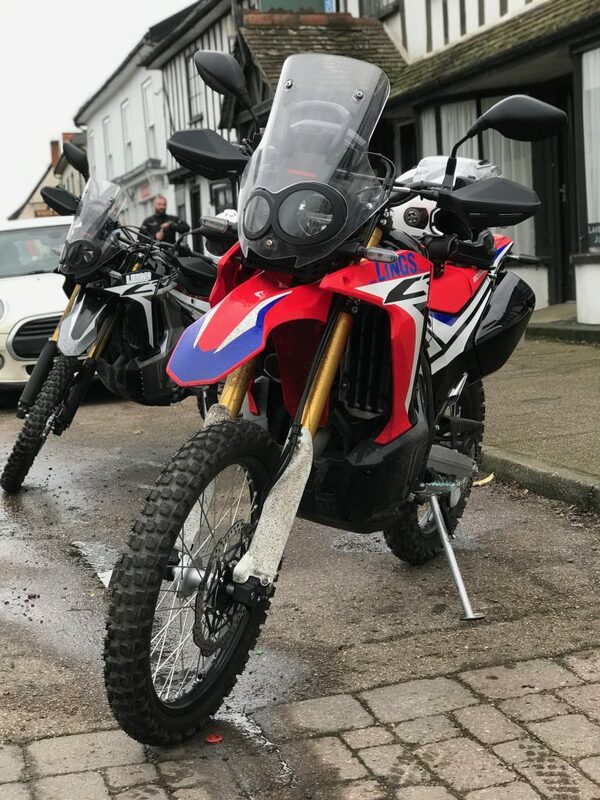 The test ride to Sudbury gave us the opportunity to visit the Adventure Bike Shop so that we could have a look at the SWM 650 Superdual Adventure. This bike, to me, is a bit of an unknown: SWM is an Italian manufacturer who are owned by a Chinese company that are using a BMW derived Husqvarna engine in a light-weight bike that comes in several formats… I think. The shop had 3 of the bikes in stock for around £7,500, but none of them were the same: one didn’t have ABS and another had a 19 inch front wheel so I was a bit confused. They were also above my ceiling of £5,000 although Mike did find some at other dealers for a lot less than the list price. Both Mike and I really liked the bikes and I was willing to ignore my price limit as these bikes are basically ready to go with everything included: crash protection, auxiliary lights and sockets along with a full set of hard luggage. Add all of that to any other bike and you’re looking at another £1,000+ so, if we could get the bikes for around £6,000 or a little over, they wouldn’t be breaking the bank. 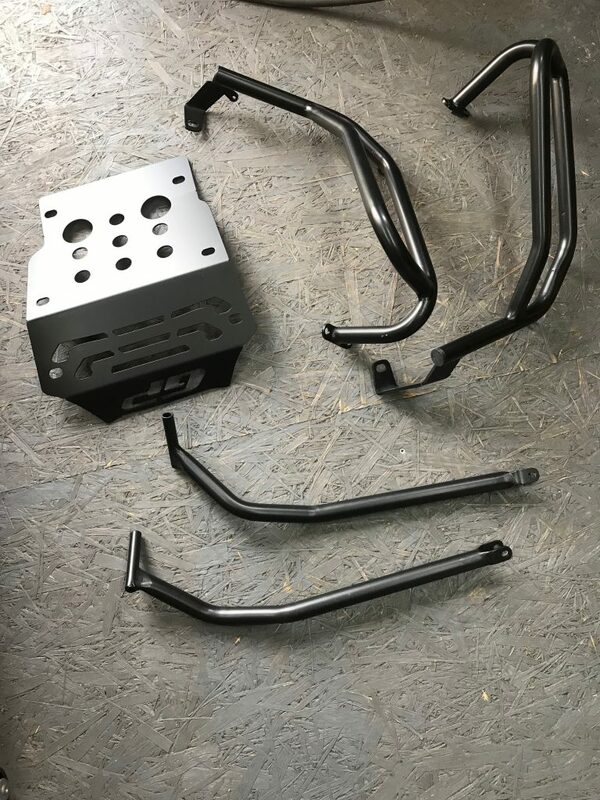 On the down side, at the time we were looking at the SWM, their UK importer had just gone bust and we weren’t sure of how easy or hard it would be to source parts once we left Europe. Then we have the Royal Enfield Himalayan. This is the bike that I really wanted to do this trip on: it’s an air-cooled, 411 cc long-stroke single that is totally unstressed in a chassis that is made how bikes used to be made: from steel. 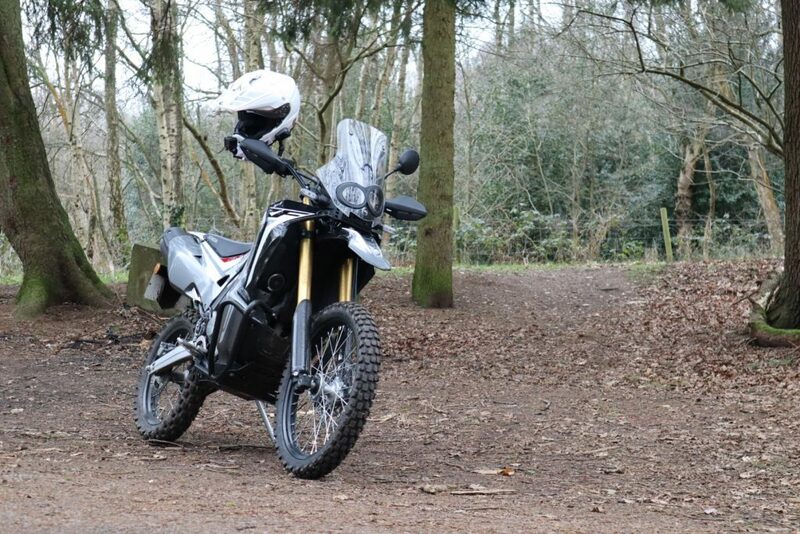 At £4,199 on the road, the Himalayan is a bargain. It’s not fast as it only has 24 horse power and it’s a bit heavy at around 190 kg but it does what it does with ease and comfort. The seat height is pretty low for this kind of bike but that means that Mike is able to get both feet flat on the ground, which can’t be said for all of the bikes we sat on! When you consider what the Enfield factory in India has been producing for over half a century, the Himalayan is a huge departure from their standard line-up of bikes that have hardly changed since production left the UK. We both really liked this bike and, for me, it was the front runner for the whole of the search. It is a bike that can be worked on anywhere if something fails or breaks and, being made in India, it is designed for conditions far harsher than you would encounter within Western Europe. It really did tick all of the boxes. 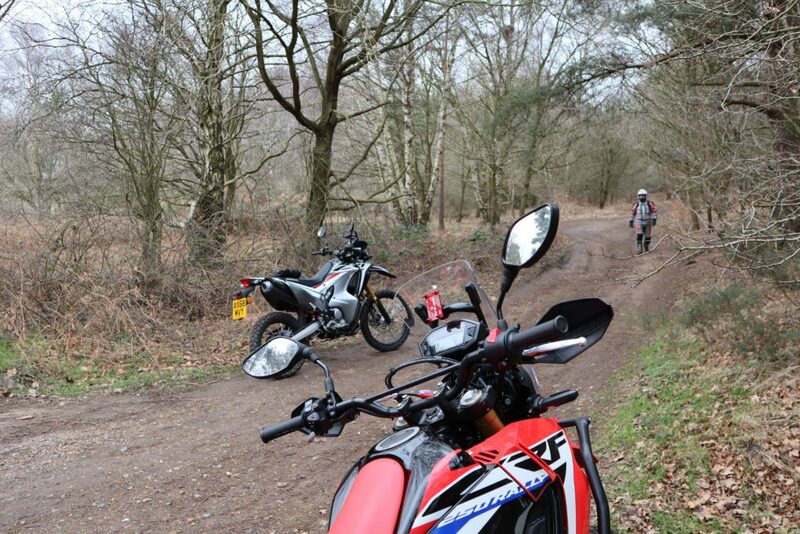 Then, without fanfare or forethought, up pops the Honda CRF250L and CRF250 Rally. 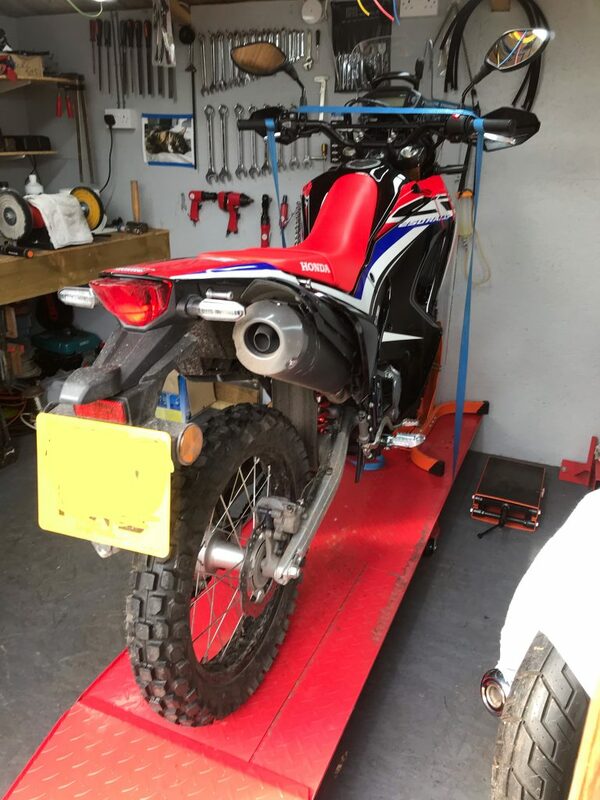 I know that Mike had been following Steph Jeavons on Instagram or Twitter who had travelled over 50,000 trouble-free miles on a CRF250L, so I think that I just searched for the bike on the Honda website and was amazed to find that the L model was around £4,600 with the Rally at around £1,000 more. 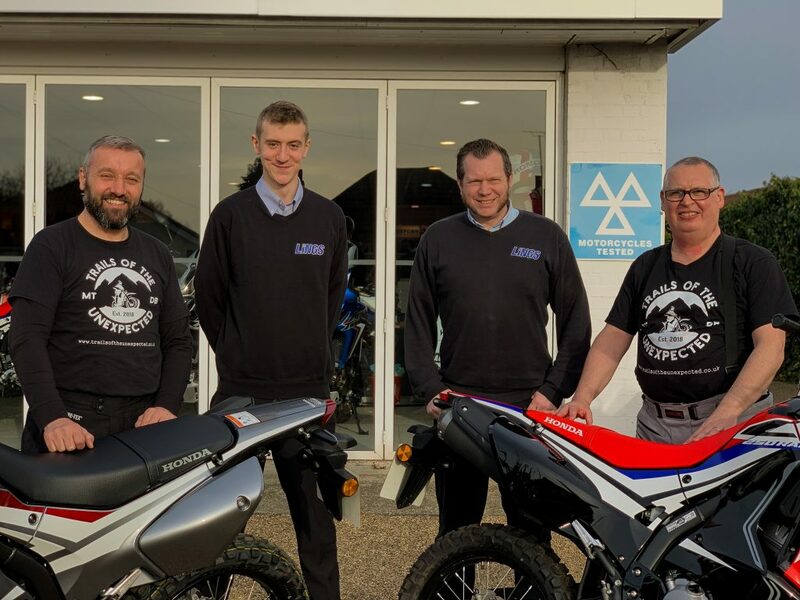 I had a quick look on our local Honda dealer website (Lings in Ipswich) and found that they had one of each model in their showroom, so I suggested to Mike that we should pop in to see them at the weekend. 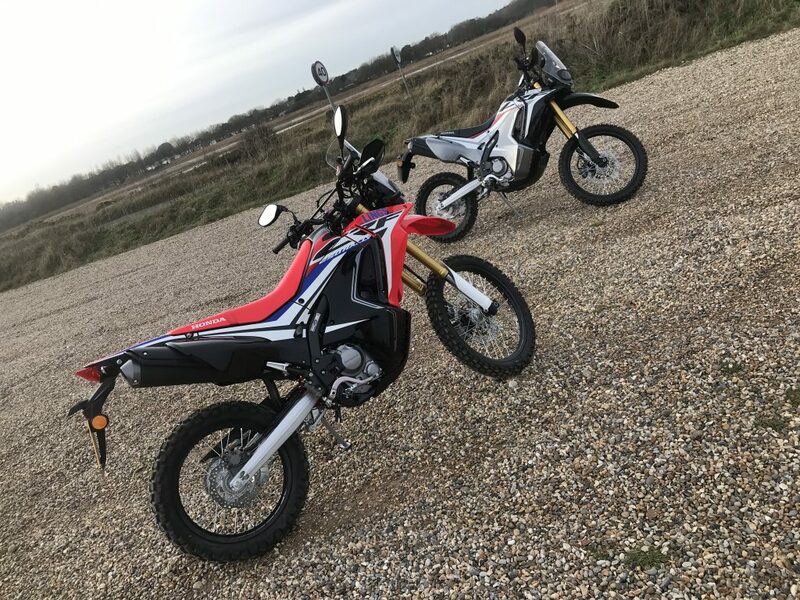 So there we were, at the beginning of January, 2019, in the Lings showroom bouncing up and down on a pair of CRF250s… and enjoying their lightness and size: not too small and not too big. I was thinking that a pair of modified L models would be good, even though I preferred the Rally with its screen and slightly better weather protection and then Mike sat on the Rally and was surprised that he was able to get both feet on the ground: the seat height on the Rally is a massive 895 mm, nearly an inch higher than the L model and a whopping 2 inches more than the much coveted KTM 790 Adventure R which, if money was no object, we would have both chosen for this trip. The reason for Mike sudden leg extension was actually down to the fact that the suspension compresses a long way once the rider sits on the bike. 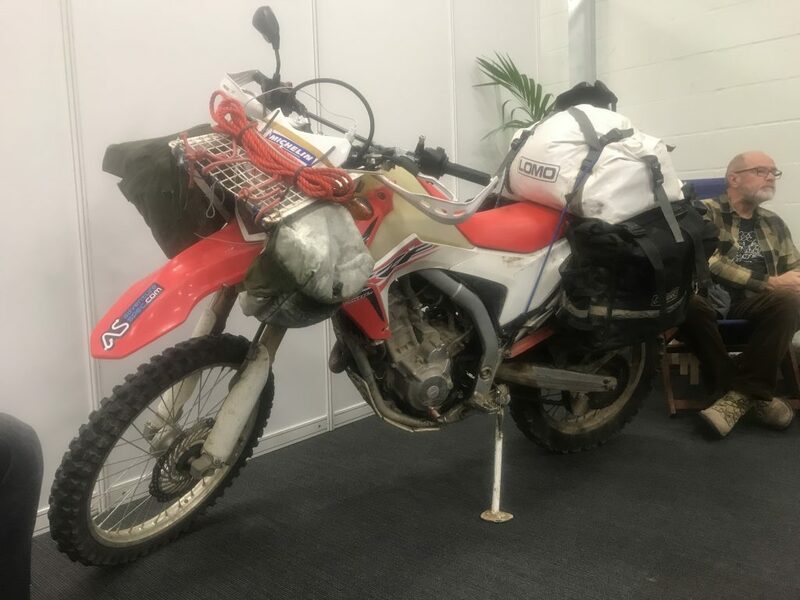 We got chatting with the sales chaps and found that, as the new models were coming in soon, they had a red CRF250 Rally for just under £5,000 on the road. This really got the little grey cells working and, after an hour or so of chat and looking around the bikes, Mike and I retired to the pub across the road for a bit of refreshment and to regroup. We both really liked the bikes and decided that, if they could get a black one for me at the same price, we would do the deal and buy a pair. That was it: the deal was done and all we had to do was wait a couple of weeks. Two weeks later, we turned up at Lings at 9 o’clock on a Friday morning with that child-like expectance on a Christmas morning. 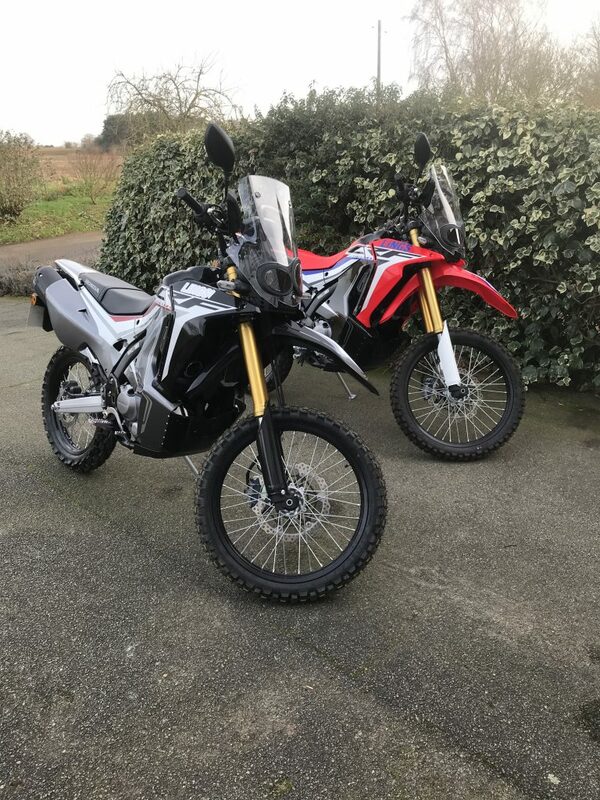 Neither of us had even had a test ride on these bikes but here we were, handing over nearly £5,000 for a brace of Hondas that would be our transport for the trip of a lifetime. Well… they’re Hondas; maybe not the most inspiring engines but something that we know will do this kind of trip without any fuss as long as we look after them and change their oil every few thousand miles. They are so prolific that we should have no problems finding any parts that we may need in most major towns anywhere along our route. We’ve both owned Hondas before and we both like them. As Mike has already said, the first big step has been taken and it’s now, finally happening. We have already looked at virtually every after-market gadget and gizmo available to make these two World conquering bikes and I’m sure many will make it on to the bikes. Here’s to the next year of farkling! For many trips, inspiration can come from something that has happened in a person’s life such as recovering from an illness, retiring or coming into money in some way. 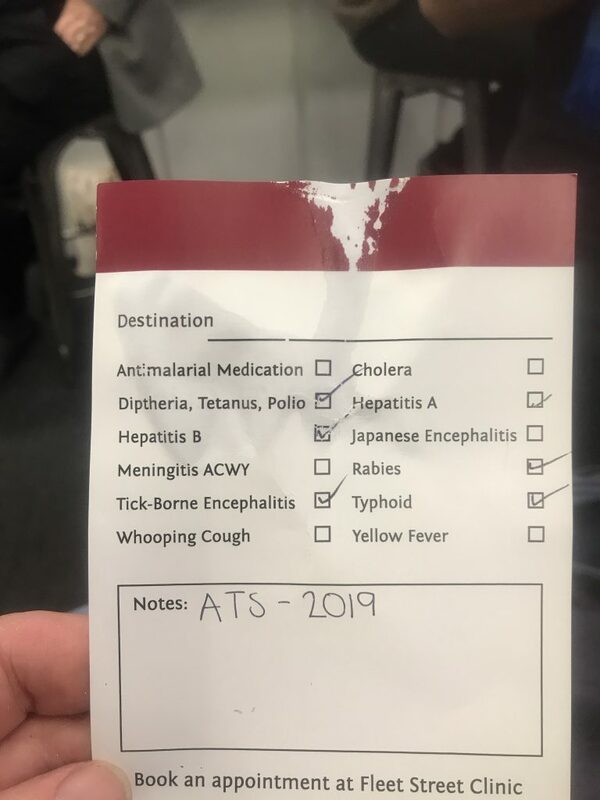 I’ve read many ride reports where something has jolted the author into action as they’ve embarked on the “bucket list” or a “once in a lifetime” trip. For me, it’s not like that: this trip, or something like it, has been at the back of my mind for nearly 30 years when, in my early 20s, a girlfriend and I talked about selling our houses, packing our jobs in, heading over to America to buy a Harley-Davidson Electra Glide and seeing how far around the world we could get. That was around 1990 when the furthest I had ridden on a motorcycle was over to Duisburg in Germany to see my sister who was studying there. That was me and a mate riding pillion on a Harley-Davidson 883 Sportster with another mate on a Kawasaki GPz550 riding down from Lincoln to Dover to catch the ferry over to Calais and then a quick run through Belgium and over the border into Germany. 500 miles in a day and we were gods! Of course, we were totally unprepared: I was riding a bike with a 2-gallon tank that would only manage 100 miles before needing a refill and, of course, I didn’t take a toolkit… so, by the end of the trip, my chain was so loose that I was having difficulty changing gear. Over the years, the trips have continued and, as I have explored further into Europe, I have always been restricted by time and money. A two-week trip seems to be the limit when you’re working and, as my work has never really brought in a huge pay cheque, the cost of travel has limited how far I can go before heading back home. My limit seems to have been reached when, in 2016, I took a wonderful, 5,000-mile journey up to the top of the World: Nordkapp in Norway. The trip took in 10 countries as I did a clockwise loop of the Baltic Sea, heading up through Denmark and Sweden, then back down through Finland, Estonia, Latvia, Lithuania and Poland into Germany. The problem was, although it was a wonderful trip, I felt like I was always chasing the clock: so much so that, on the north-bound leg, I missed out much of Norway thinking that I wouldn’t have the time to see everything. Then, on the return leg, I rode from Poland to the Netherlands in one day to catch the last ferry at 9pm. It was quite exhausting. 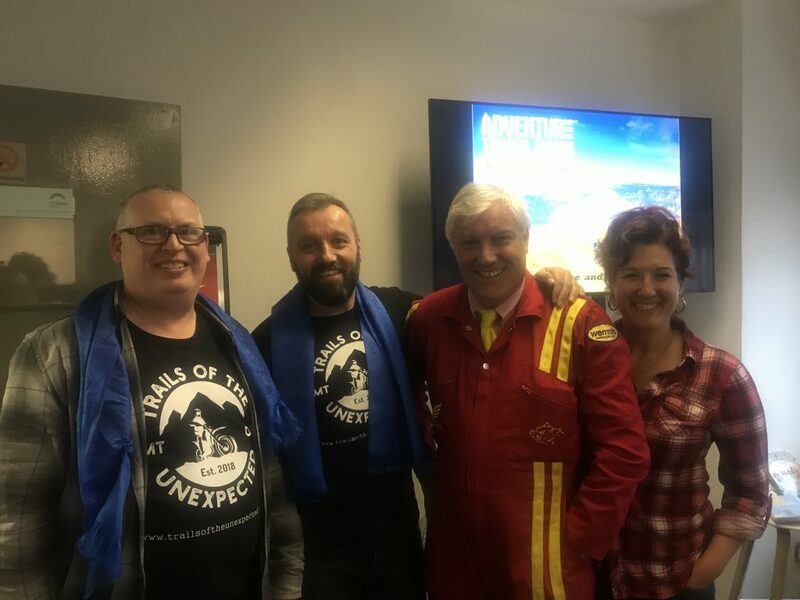 So, the inspiration to do this trip, for me, has been to push further and to take on a challenge that I have been dreaming of for most of my life. The only way that I can do that is to quit the day job and sell the house. Although I love my job, life has become hum-drum and I’m not getting any younger. We only have one life and I intend to enjoy it while I can!